Amir al Millat Hadrat Pir Sayyid Jamaat Ali Shah Sahib quds-sirruhu (c.1840 -1951) of Alipur Sharif, Sialkot, Pakistan. The Shaykh was one of the great saints of the Punjab and a sayyid also from both maternal and paternal sides of his family. His ancestors, all sufi masters themselves, hailed from Shiraz in Iran and came to the Subcontinent when one of them accompanied Emperor Humayoun back to Delhi after his exile in Iran where Humayoun had originally met him. The Shaykh's ancestors honoured the court of Humayoun with their presence but when Akbar began to deviate from the religion of Islam and announced his 'Din i Ilaahi' they left the imperial court in protest. Akbar was loathe to see such saintly persons go but they were adamant and so he granted them a piece of land in Alipur area as a parting honour. 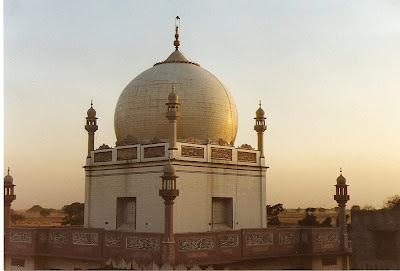 Here the Shaykh's ancestors settled in the subcontinent and their descendants have remained there ever since.Hadrat Jama'at Ali Shah sahib was renowned for his saintliness even as a young child and after completing his religious studies (he was an expert in all of the branches of fiqh but especially in the sciences of hadith) he went throughout the width and breadth of the subcontinent working tirelessly for Islam and the Muslims. He laid the foundation stones--and funded-- hundreds of mosques throughout the Subcontinent from Peshawar to Hyderabad, Deccan. He was a leading personality in all of the major movements of that time such as the Khilafat movement and he was especially active against the Arya Samaj movement and helped to save the iman of countless Muslims with his tireless efforts. He also was one of the key defenders of the Ahl as-Sunnah faith against the rise of Qadianism and also was an opponent of the reform movements like that of the Wahabis. He had a wonderful, awe-inspiring personality and was gentle and loving towards all, yet was afraid of no one when it came to defending the religion of Allah's Messenger sal Allahu alayhi wa sallam; this is demonstrated by his leadership of the Muslims during the Shahid Ganj Mosque incident where the Shaykh led the opposition to the plans of the British rulers in Lahore as well as his refusal to pray behind the official Wahabi Imams in the Haramain appointed by King Saud and his refusal to visit the King when he was ordered to do so to explain: "I am a faqeer, he is a king" was his famous reply. In the end it was Saud who relented and allowed the Shaykh to pray by himself! He received medals from the Sultan of Ottoman Turkey for his services to Islam and for his amazing generosity in helping the people of Madina during a drought there for which he received the title "Abu'l Arab".However, apart from his vast learning, it was as a Sufi shaykh that the saint was loved by the populace and it is estimated that he had over 1 million murids [disciples] from Afghanistan to the southern tip of India; he received the khirqa [cloak] from his Shaykh very soon after taking bayah [pledge of spiritual allegaince] and was thus the representative of his Shaykh early on. He was authorized to accept murids into many Sufi Orders but it was as a Naqshbandi Master that he is famous for, carrying the great secret of this Order. He transformed the lives of countless people and sinners repented at his hands by the thousand and many others themselves reached the highest levels of spiritual development by his attention. His karamaat [miracles] are too many to recount and there are many eye-witnesses to them. He was extremely generous and magnanimous towards all, especially the poor, and he would not eat alone and the poor had been invited to share his table with him. Though possessing great family wealth the Shaykh spent it all on Islam and the poor, himself living frugally in the manner of the great Naqshbandi Sufis of the past.He was a big supporter of the Pakistan movement and amongst his admirers was one Muhammad Iqbal, the poet. Also, he wrote many letters to Quaid e Azam offering advice and support and he was instrumental in getting the populace to vote for the Muslim League: he issued a fatwa saying that he would not read the janazah prayer of anyone of his mureeds who did not vote for Pakistan. He sent a tasbih and prayer mat to the Quaid too and asked him to pray regularly. As a Sufi he occupied the status of a Perfect Master and he was loved by all and sundry. It is for his love of the Beloved Prophet of Allah alayhi salaat o salaam that he is especially famous for. He passed onto his Creator in 1951 but until the very end he stuck passionately to the commands of the Shar'iah, never missing a prayer and often he would pray all night long. Inna lillaha wa inna ilayhi raaj'iun.